ESPN is relaunching their ESPN Mobile service, but this time it will sit happily underneath the Verizon megalords. 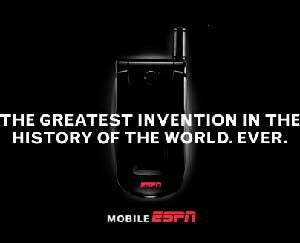 One big possibility why the original ESPN Mobile flopped was because it was a standalone cellphone company, but now it will be packaged into Verizon and their V-Cast service. Welcome back, ESPN Mobile, I hope your new service prospers, but I for one won't be signing up (because I am a T-Mobile user), but I would consider it if I were already a Verizon customer. It will be officially launching in the coming months as part of the $15 per month V-Cast multimedia package.